was also promoted on Twitter. An editor with the Dunwoody Patch was not aware of the posting until notified by a reader. The editor then emailed the author to give him the opportunity to change the online image in the post because it had the potential to be ruled libelous. However, the author did not respond within a timely manner, so the Patch was forced to delete the entire post. Additionally, Dunwoody City Council members John Heneghan and Lynn Deutsch were informed of this post on the Patch, as both have been very vocal in the past week with what they described as fear mongering by some who are considered Clean Sweep supporters. It was hoped that the two council members would also fairly criticize and dispute the article that was clearly an attempt to scare people from the "Clean Sweep". However, after repeated attempts, neither Heneghan or Deutsch would offer any reply or comments. Dot Garrison is 88 years old. She has lived on one beautiful corner of Dunwoody since 1952. She thought that she had seen it all. Then, accompanied by a neighbor, she went to a city meeting about intersection improvements at St. Luke’s Presbyterian Church. It was right there on the renderings: a large chunk of her carefully landscaped property might be taken by the city as part of the plan for the Mt. Vernon and Vermack roads improvement. Mrs. Garrison lives in what some residents call the cabin, a comfortable, rustic home on the southeast corner of that intersection, landscaped against Vermack road. City officials confirm that in the first stages of design, her property would suffer from the installation on Vermack of a turn lane, two four-foot bike lanes and two five-foot sidewalks plus landscape buffers. The road is now 30-feet wide. The city plan would bring it to 60 feet with travel lanes and curbs. Note the loss of landscaping and property to the home. The right to vote was a popular rallying cry of citizens attending Dunwoody’s charter commission meeting on the eve of Independence Day. One even chided the commission for holding the meeting on July 3, stating that it was a means to suppress citizen input. The commission, an appointed group of five citizens, was formed to review the city’s charter and recommend changes in a report to legislators Fran Millar, Tom Taylor and Mike Jacobs (none of whom serve on the city council.) The group has been meeting for weeks, and the past three sessions have seen citizen attendance skyrocket. The existing charter states that a change in city services requires a citizen vote, but it does cover fire services if the city wanted to add them. The recommended change states that council can vote to change city services as long as the rate does not exceed the average rate of the preceding three years prior to the cutover of the service. Services currently provided by DeKalb County are subject to this vote, including fire services. At a recent city council meeting, city staff recommended that council approve $75,000 in funding to conduct a feasibility study on fire services. One of the concerns the city has with fire service from the county is the increasing millage rate for that service, from 2.75 to 3.29 mills over the past three years. The thought of council changing fire services without a citywide vote brought harsh comments from a few citizens including one who only gave her first name, Cheryl. Another citizen asked if the city had statistical data to back up a decision to change the city’s fire service. Merry Carmichael reminded the commission that the current charter clearly states that the millage rate cannot exceed 3.04 unless approved by a majority of Dunwoody voters. Other citizens took the opportunity to air their disappointment with other city decisions like the Dunwoody Village Parkway project. Katherine Wrigley said that she hated to see the trees destroyed in the median on the parkway and asked if it was really necessary? Weisser said no one in her neighborhood was in favor of the parkway project. She recalled a homeowner’s meeting in her neighborhood that a council member attended. After the meeting, Weisser said she received an email from that councilor who wrote that he thought more than half the people approved of the project. Max Lehmann, commission chair, reminded citizens that the commission had no purview over that project. Other citizens used their comment time to talk about the upcoming election, including Jim Dickson who asked the group to hold off finalizing their report until after the election. “The election is going to bring out how people really feel about a lot of these things,” said Dickson. Smith said that she would campaign in the next election to fight for the city. The growing number of citizens attending the meetings prompted the commission to discuss pursuing a larger venue. Lehmann said he wanted to make sure citizens were comfortable at the meetings, and to be able to hear the discussions. The large group left some standing outside of the confer- ence room while others sat on the floor. The group spoke briefly about the municipal court portion of the charter which brought a very small change re- garding judges. Instead of mentioning judge pro tempore, the commission voted to recommend the language be changed to simply judge(s), plural. City manager Warrant Hutmacher said there was no benefit to dis- tinguish between a judge and a judge pro tempore as there were no distinguishing responsibilities. The charter’s next meeting is July 17 and they will discuss the area of the charter related to finance. In one of its first discussions as a body, the Dunwoody Charter Commission brought up the suggestion of changing the language in the city’s charter in regards to the ad valorem tax. The commission, made up of members Mallard Holliday, Max Lehmann, Rick Otness, Beverly Wingate and Robert Wittenstein, discussed last week how the city would pay for its own fire department in the future. Commission member Robert Wittenstein brought up a section of the charter that references the millage rate cap for the city that is set at 3.04 mills. Under the current city charter, there is a cap on the rate of taxation of property owners at 3.04 mills and if the city wanted to raise the millage rate, it would require a resolution to go before the voters. The current millage rate is 2.74. Only in the discussion phase, once McLendon brings the language back to the commission, and the group has time to review it, they will then decide whether submit it to the Legislature. Hutmacher reiterated the general assembly has the final say on any changes to the city charter. In mid-February, Mayor Mike Davis shared his vision for Dunwoody at the 4th annual state of the city event for the city. One key focus was on transportation accessibility. During a portion of his speech he claimed that the Vermack-Womack intersection is failing due to congestion, while at another part of his 65 minute address, the Mayor conceded that the reality of the traffic situation across the city is due in part to people using Dunwoody streets as a cut-thru when the highways are congested. However, this revelation did not alter his opinions for the idea that the city should seize property owners' land to construct a roundabout at Vermack-Womack roads to deal with the number of cars there. Recall that at the November 12, 2012 City Council meeting, Mayor Davis stated that Womack Road is a major thorough fare and is "not a residential street". He argues it is used and needed to move people across the city (including people from other cities who get off the highway). Note, the traffic studies used in assessing the Vermack-Womack intersection do not consider the numbers of commuters from other cities, so it is impossible to determine who would be benefitting from this 1 million dollar proposal. Click below to listen to a brief audio clip from the State of the City Address on Tuesday, February 19, 2013 to hear Mayor Davis acknowledge that it would take an infinite amount of money to accommodate commuters from other cities who desire to use our streets as a cut-thru. 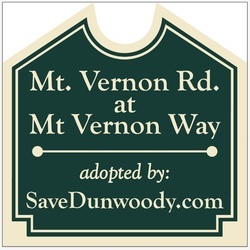 SaveDunwoody.com is participating in the city of Dunwoody's Adopt-A-Spot program, to beautify and maintain a section of roadway along Mt. Vernon. Email us if you would like to help. Two restaurants announce they are opening in Dunwoody Village – [despite Dunwoody Village Parkway looking the way it is]! 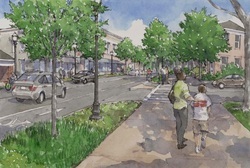 If changes are made to Dunwoody Village Parkway as shown in the artist rendering promoted by Dunwoody leaders, along with the city’s “Master Plan” for the Village, these two new restaurants would most likely be expected to wait for new buildings to be built along the street and would not be able to open in existing spaces. 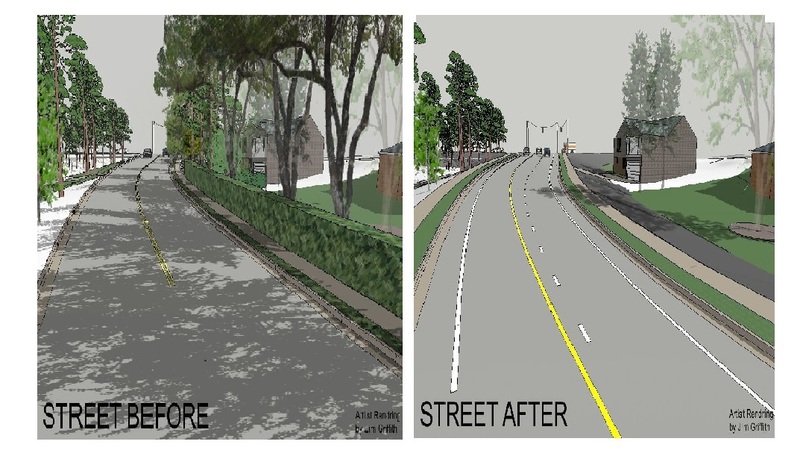 There currently are no buildings along the street as depicted in the drawing for “improvements” to the parkway, and there is no public knowledge of anyone offering to build them. These businesses are opening without the city spending nearly 2 million dollars on the street.